In the vein of more growth is always better mentality, the following struck me as I was in Colorado last month. Front Range politics are a big deal in Colorado because virtually all the people in the state live within 60 miles of Denver. The following table outlines the populations of the Front Range counties and their growth trends over the past three years. Big growth. So the local politicians are happy. Growth is good. Then I read an article by Bruce Finley of the The Denver Post entitled “Colorado shies from big fix as proliferating people seek more water.’ The concept is to continue the state’s tradition of moving water from the wetter west side of the Rockies to the drier east side. 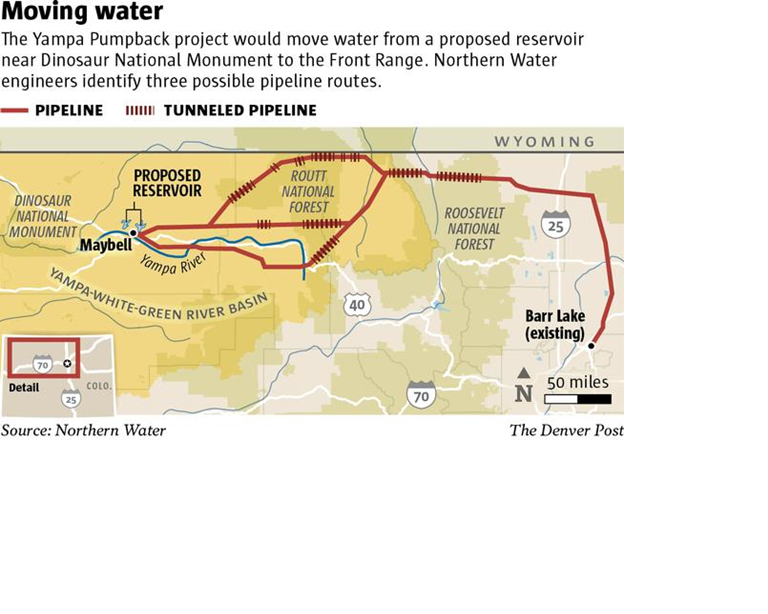 The current fix is to build a huge reservoir by Dinosaur National Monument (in the middle of the west Colorado desert), then divert 97 billion gallons a year from the Yampa River through a 250-mile pipeline across the Continental Divide to the Front Range to defray Colorado’s projected 2050 water shortfall of 163 billion gallons. The Yampa Pumpback would be the 31st cross divide diversion Colorado has built since the 1930s. Now the plan has hit a snag, whereby the EIS for the project indicates to meet needs, it would be the Front Range that bears the risks of not enough water in dry years as a part of negotiations for water entitlements under the interstate treaty that divvies the Colorado River. Once that is resolved, the project would cost billions and take years to construct. Ok, the Front Range is water limited. And we all know it. The problem is people like Northern Water manager Eric Wilkinson who the article quotes as saying. “With the number of people coming here, we’re going to have to look at all alternatives. Conservation isn’t the silver bullet; it’s also going to take additional infrastructure…. These people need water, and they’re willing to pay for that water.” In other words, we need more growth! 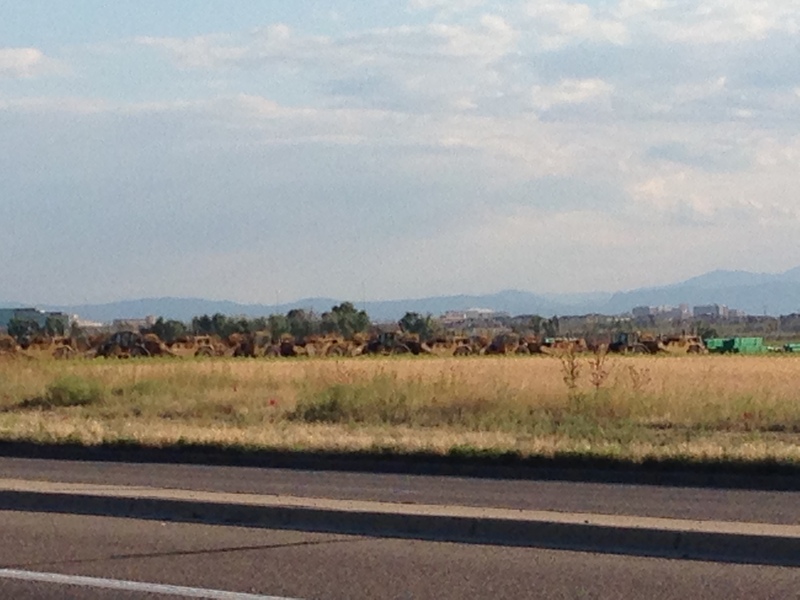 So in the meantime, development competes with agriculture or replaces agriculture on the semi-arid high plains. The article suggests that cities and industries seeking more water would absorb hundreds of thousands of acres of agricultural land water rights if unable to divert more across mountains, something the governor is a little concerned about. They would just buy them out. So less agriculture when we probably will need that land later. So in that vein, I noted the following at the airport. One is a nice field of grain. Golden in the summer sun. 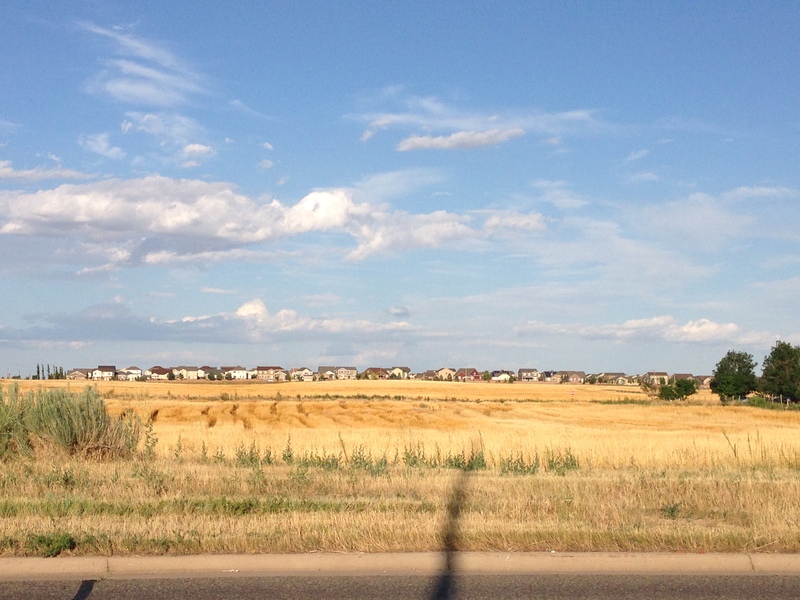 Across the street, the golden field is being converted to 300 houses. You can see the pipe and the equipment. And my question is – Is this really a good idea?